Ever wonder how long a Repeal will take? It’s not certain if The Affordable Care Act, aka Obamacare, will be repealed, especially at the pace that government is working. Granted, it is a complicated piece of legislation and undoing it won’t be easy no matter who is in charge of things. To repeal Obamacare, one of the things that the GOP would need is at least 8 Democrat votes to pass it through the Senate. Even though the repeal process could take years, the Republicans are confident about their ability to accomplish a replacement plan. To read more about these challenges, go to ourcarebill.org. Wouldn’t it be fun if you could build your own health bill? 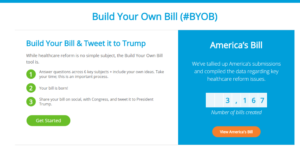 At Build You r Own Bill #OurCare #BYOB (Sponsored by HealthMarkets Insurance Agency) Americans and business owners can have a voice in the healthcare reform discussion. Become a partner, because your voice should be heard. If you visit the Build Your Own Bill website, you find tools that let you determine what you want to be included in America’s healthcare legislation. And if that wasn’t enough, the exciting part is that the tool allows you to easily share your healthcare bill with your social media sites and your friends. Also, find your politicians in Washington and make sure they hear you directly. You can even tweet your bill directly to the President! When you become a partner, you become more aware in the process that is going to affect your lives and business all over America. Robert is an impartial agent, and HealthMarkets Insurance Agency is an advocate for their consumers. They both want to find quality health care solutions at an affordable price for you. Robert knows that HealthMarkets is a leading distributor of individual and family health insurance in America. The agency has the experience that comes from enrolling 2 million plus insurance policies since the Affordable Care Act (ACA) began. From HealthMarkets’ founding in 1984, they have experienced the good and the bad. Better than most, they know the industry has room for improvement. Robert believes that it’s his job to find solutions for his consumers. He’s very proud that the company he represents, HealthMarkets, is making it their duty to give a voice to you–his customers. 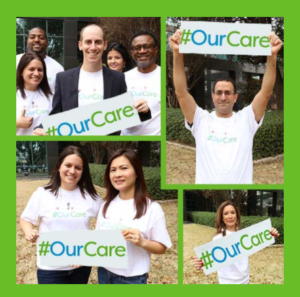 The #OurCare movement represents HealthMarkets’ attitude towards their job and their relationship with their consumers. They believe you deserve a voice and a choice as to what happens with your healthcare in our country!